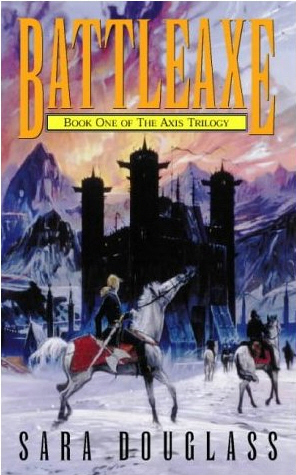 Sara Douglass’ BattleAxe, the first in her Axis Trilogy, was first published in 1995. It can’t have been long after that when I first read it; I was certainly young and imaginative and impressionable. It was – and remains – a favourite. Re-reading it now, I can’t help but recall including it in my usual style of play: role-playing, or re-enacting. In my imagination, I was everybody: Azhure, strong and determined but beset by self-doubt; Faraday, sacrificing all for the Prophecy; even Axis as he discovered and re-invented himself. I went on to read all nine of the Axis books. They nurtured my on-going love of fantasy, and hold a special spot on my heart to this day. Reading it now evokes childhood. Then somehow I forgot Sara Douglass. Her books sat on my shelf for years, gathering dust, as I went on to obsess over Terry Pratchett, Isobelle Carmody, Daphne Du Maurier, and other forever-favourites. One day in a bookshop I saw one I’d never seen before – and, at a busy time in my life, a stand-alone fantasy book was a rare and welcome thing. The Devil’s Diadem, thank you very much, more Douglass adoration without having to commit to a long series. It was shortly after that I discovered she had passed away. I was about two years late to hear the news, making the shock surreal. I confess to shedding a tear or two despite never knowing her personally; she was a wonderfully talented Australian writer, and I felt the loss. So now, even as I read her words and feel her tremendous power as a story-teller, there is an additional sadness. I’m a grown up now, and she is gone.